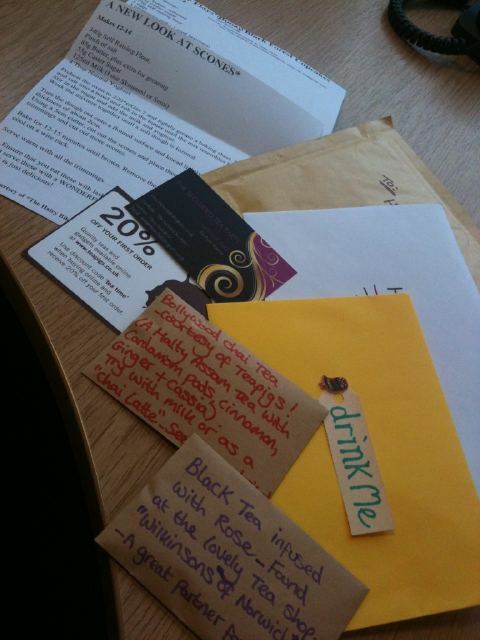 My First Ever Virtual Tea Party….. Glitches and all!…. Why a Virtual Tea Party? Well, I have had so many people telling me that they would LOVE to attend my underground tea party, however are unable to make it for various reasons. I sat and thought about this, and decided that perhaps I could take the tea party to them in some way. ……This could mean packing up a cup and saucer, and a pot of tea and some cakes and delivering it to their door…..but what if they lived miles away …or even overseas? !….that just isn’t logistically possible, however nice a holiday in Canada would be! ….. So…. 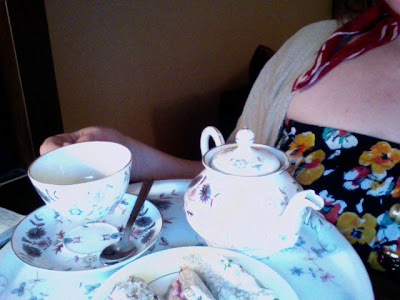 How about arranging a mass tea party via webcam, online in the comfort of our own homes?……. So I planned to do just this. My First Virtual Tea Party was held last night, Sunday 23rd January 2011 at 5pm…and it didn’t go completely glitch free I am sad to write haha…..At least we could laugh about it!….I really felt quite frustrated to start with…..
….I had planned everything to the finest detail and spent a few weeks trying to make sure that everything was thought of and double checked, and I was very satisfied that I had done just that, and was very happy indeed with my preparations. Technical calls had been made, and had been glitch free…..so nothing to worry about…..Right?…. ….However, on all logging into Skype to “meet” at the arranged time, we had a few issues with the webcam side of it, and could only hear each other. For a few moments, myself and another guest could see each other, but then that picture disappeared and we could only speak through our mics, which was very disappointing indeed. My second guest for the afternoon had a husband who works in IT, however we just could not get the 3 webcams to marry, and so we decided on continuing the tea party by voice – Setting the scene by discussing what we were all eating and drinking, and taking photos of course to prove that we had enjoyed this afternoon. The great thing was that I could hear that hugely satisfying sound…..the clinking of china in the background, so I was a very happy bunny….glad to find that we weren’t all fibbing and sat there drinking a can of coke, which helped to ease my worries!! This helped with exciting and intriguing my guests, and they enjoyed smelling the loose leaf teas and drooling over the recipes a few days beforehand. So with this pack, I had put together a little note, explaining when and what time and how it would all work, as well as emailing my guests to get them chatting and discuss technicalities with them both. So all went to plan in that respect. They both answered some questions about themselves and we all shared our blogs and websites with each other to do a little research before we met which was really great to be able to do! We all had twitter accounts too, so there was great banter going on there too. All very exciting indeed. My two lovely guests were Marie-Claire from Nouveau Cakes, a fellow underground tea party hostess from Huddersfield who made some lovely looking scones using the idea that I had sent her for my personal favourite scone recipe. The fruit and the golden colour in the photo she had taken made me feel hungry just looking at it! – I had also posted them each a recipe for my Boozy Black Forest Cupcakes, which Helen had bought the ingredients for, and plans to bake in the not so distant future, so I am very much looking forward to seeing those and how she presents them, as they will look fab! They really are tasty recipes, and so easy to make. I am just glad that I am able to share them with others and that they are making and enjoying them! Myself, seeing as I had spent the weekend making Oreo cupcakes for my sisters’ Birthday party, was a little cupcake-d out, so I made some delicate tea party sandwiches to enjoy with my tea. I made a combination of Egg Mayonnaise with Cress & Black pepper, and also some of my tasty Ham & Garlic Jam on Granary, both went down a treat for a well deserved savoury option. I had also posted out two of my favourite teas to them, along with instructions on how to brew and enjoy them. The teas that I had chosen to share were the Chai Tea from Teapigs, which can also be used to make a delicious sounding Chai Latte which I have yet to try! 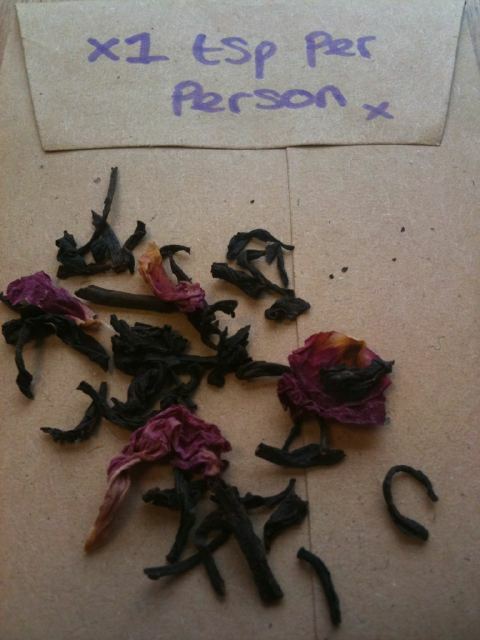 And I had also sent a Rose Infused Black tea from a lovely little tea shop called Wilkinsons of Norwich. This tea goes very well with cake….all cake I have decided in fact! And it went down very well with both of my Virtual guests. It is very light, and can be sipped black and tastes not as strong as they had both thought it might do. It really is a winner. 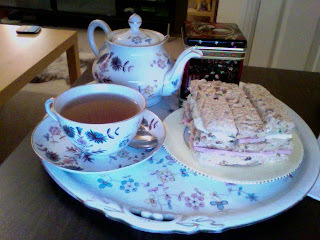 And I am very glad that my guests enjoyed this tea as much as I do. I highly recommend this to try if you like infused teas. We had a great chat, and the hour FLEW past, I couldn’t quite believe it went so fast, even if it was just our voices. I still enjoyed sipping my tea in unison, and swapping cake-related notes and discussing ingredients, and tea and all things tea party! It was great fun! And I will be arranging more in the future! I can’t apologise enough to my guests for the technical issues, and I will be arranging a second meet in the near future, so that we can do this face to face again. Despite the technical hitch, I still feel that I have made two FANTASTIC new acquaintances through this experience, and I hope to “meet” face to face very soon….I am working on this issue as I type hehe! This is such a great way to make new friends and I hope to have new people joining me and my virtual guests (Wherever you are in the world!!!) very soon!….It really is great fun! And I intend to change the theme and format every time, so drop me a line should you fancy joining in…I can arrange a virtual meet around YOU and your freetime! (Found your search googling ‘virtual tea party’, as my girl friend moved to a new province (yes, in Canada) and now we can’t have girly-tea-dates to hang out and chat.